Howdy Doody was an American children's television program (with circus and Western frontier themes) that was created and produced by E. Roger Muir and telecast on the NBC network in the United States from December 27, 1947, until September 24, 1960. It was a pioneer in children's television programming and set the pattern for many similar shows. One of the first television series produced at NBC in Rockefeller Center, in Studio 3A, it was also a pioneer in early color production as NBC (at the time owned by TV maker RCA) used the show in part to sell color television sets in the 1950s. On the air with the first Howdy Doody puppet. The original Howdy is immediately to Smith's left. The two other puppets are Mr. Huff and Eustis who appeared only for a short time on a Saturday edition of the Puppet Playhouse show. Howdy Doody views the results of his "plastic surgery." Bob Smith created Howdy Doody during his days as a radio announcer on WNBC. At that time, Howdy Doody was only a voice Smith performed on the radio. When Smith made an appearance on NBC's television program Puppet Playhouse on December 27, 1947, the reception for the character was great enough to begin a demand for a visual character for television. 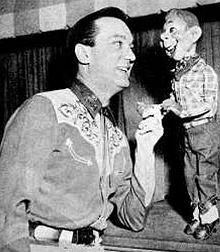 Frank Paris, a puppeteer whose puppets appeared on the program, was asked to create a Howdy Doody puppet. Bob Smith, the show's host, was dubbed "Buffalo Bob" early in the show's run (a reference both to the historical American frontier character Buffalo Bill and Smith's hometown of Buffalo, N.Y.). At first the set was supposed to be a circus tent, but soon was changed to a western town. Smith wore cowboy garb, as did the puppet. The name of the puppet "star" was derived from the American expression "howdy doody"/"howdy do," a commonplace corruption of the phrase "How do you do?" used in the western United States. (The straightforward use of that expression was also in the theme song's lyrics.) Smith, who had gotten his start as a singing radio personality in Buffalo, frequently used music in the program. Cast members Lew Anderson and Robert "Nick" Nicholson both were experienced jazz musicians. With Paris's past disappearances, impromptu excuses regarding the whereabouts of Howdy Doody had been hastily concocted. This time, an elaborate explanation was offered—that Howdy was busy with the elections on the campaign trail. NBC hurriedly constructed a map of the United States, which allowed viewers, with the help of Smith, to learn where Howdy was on the road. The explanation continued that while on the campaign trail, Howdy decided to improve his appearance with some plastic surgery. This made it possible for the network to hire Velma Wayne Dawson to create a more handsome and appealing visual character than Paris' original, which had been called "the ugliest puppet imaginable" by Bob Smith. Since Paris did not provide the voice of the character, Howdy's voice would stay the same after his appearance changed. The puppet which is remembered as the "original" Howdy Doody replaced Paris's original. Howdy Doody himself was a freckle-faced boy marionette with 48 freckles, one for each state of the union at the time of his creation (up until January 3, 1959, when Alaska became the 49th state), and originally was voiced by Buffalo Bob Smith. The Howdy Doody show's various marionettes were created and built by puppeteers Dawson, Scott Brinker (the show's prop man), and Rufus Rose throughout the show's run. The redheaded Howdy marionette on the original show was operated with 11 strings: two heads, one mouth, one eye, two shoulders, one back, two hands and two knees. Three strings were added when the show returned—two elbows and one nose. The original marionette now resides at the Detroit Institute of Arts. There were duplicate Howdy Doody puppets, designed to be used expressly for off-the-air purposes (lighting rehearsals, personal appearances, etc. ), although surviving kinescope recordings clearly show that these duplicate puppets were indeed used on the air occasionally. "Double Doody", the Howdy stand-in puppet, now is in the collection of the Division of Culture and the Arts at the Smithsonian National Museum of American History. Photo Doody is the near-stringless marionette that was used in personal appearances, photos, parades, and the famed NBC test pattern. He was sold by Leland's Sports Auction House in 1997 for more than $113,000 to a private art collector, TJ Fisher. Buffalo Bob with Howdy Doody and Flub-a-Dub. Heidi Doody - Introduced as a stranger who saved Buffalo Bob's life in Africa, she was adopted as Howdy's sister. Phineas T. Bluster - The resident skinflint, mayor of Doodyville and nemesis of Howdy; one of the Bluster triplets. Petey Bluster - Phineas's nephew. Don Jose Bluster - The South American Bluster brother. Princess SummerFallWinterSpring - Introduced as a puppet, then played by actress Judy Tyler, who had appeared opposite Elvis Presley in the 1957 film Jailhouse Rock. After she was killed in a car accident on July 3, 1957, at the age of 24, the character was portrayed by a marionette. Dilly Dally - Howdy's naive boyhood friend. Inspector John J. Fadoozle - "America's No. 1 private eye" whose character was revealed as the mysterious "Mr. X" who used the pseudonym to run against Howdy for the office of President of All the Boys and Girls of America; children could vote by using ballots that were attached to the wrappers of loaves of Wonder Bread, a major sponsor of the show. Chief Thunderthud and Chief Featherman - Two of several Native American characters used to emphasize the show's western theme. J. Cornelius Cobb - The shopkeeper played by Nick Nicholson, who had a strong dislike for clowns. Flub-a-Dub - A combination of eight animals. He had a duck's bill, a cat's whiskers, a spaniel's ears, a giraffe's neck, a dachshund's body, a seal's flippers, a pig's tail, and an elephant's memory. Hyde and Zeke - Twin bears. Mambo - An African elephant. Tommy Turtle - A slow-talking turtle who is not very bright. The mute Clarabell the Clown who communicated in mime, by honking horns on his belt, and by squirting seltzer. Originally played by Bob Keeshan who went on to create the children's TV character "Captain Kangaroo." He was later played by Robert "Nick" Nicholson and finally by Lew Anderson. Sir Archibald (played by Dayton Allen) - An explorer. Chief Thunderthud (portrayed by Bill Le Cornec) - Head of the Ooragnak (kangaroo spelled backward) tribe of American Indians. Edward Kean originated Thunderthud's greeting "Kowabonga! "—a nonsense word that eventually became part of the California surfer culture lexicon. The characters inhabited the fictional town of Doodyville. Several characters (including Ugly Sam, the world's worst wrestler, and Pierre the Chef) were played by comedian Dayton Allen, who later went on to become a cast regular on NBC's primetime The Steve Allen Show. The Howdy show's non-televised rehearsals were renowned for including considerable double-entendre dialogue between the cast members (particularly the witty Dayton Allen) and the puppet characters. Corny Cobb was played by Bobby "Nick" Nicholson in 1952, by puppeteer Rufus Rose in 1953 and 1954 while Nicholson assumed the role of Clarabell, and again by Nicholson from early 1955 until the end of the show. Clarabell was first played by Bob Keeshan (who also played The Featherman). Keeshan continued in that role until December 1952, when he, Dayton Allen, puppeteer Rhoda Mann, and Bill LeCornec left the show over a salary dispute. The role of Clarabell was then taken by Nicholson, who played it for about 22 months. In January 1955, the role was turned over to Anderson, who kept it until the series ended and for all subsequent revivals and specials, while Nicholson took on the role of J. Cornelius "Corny" Cobb. At the end of the final episode, telecast on September 24, 1960, Clarabell broke his series-long silence to say the final words of the final broadcast: "Goodbye, kids." Each of the cast members also played other roles as required. Howdy Doody dolls were also sold commercially, as well as marionettes of Howdy Doody and Flub-a-dub. There were also two other marionettes, Don José, and Hector Hamhock Bluster, brothers of Phineas T.
In addition to the original vintage puppets, puppetmaker Alan Semok (at the request of Bob Smith in the early 1990s) created several precise replicas of Howdy, including—thanks to improved materials and new molding techniques—a more exact marionette replica than had ever been produced, as well as a new Photo Doody which Smith used in personal appearances until his death from cancer on July 30, 1998, at the age of 80. One of Semok's marionette duplicates appears on a 2005 cover of TV Guide magazine as part of a series recreating classic covers from the magazine's history. The cover featured Howdy with TV host Conan O'Brien dressed as Buffalo Bob Smith. Another of the Semok duplicates resides in the International Museum and Library of the Conjuring Arts, the private museum owned by renowned illusionist David Copperfield. After the death of Bob Smith, a fierce legal and custody battle for the original Howdy Doody puppet erupted among his heirs, the Rufus Rose estate, and a museum to which the marionette had been bequeathed. Howdy once again was in the news, with his face and story making headline broadcast, wire, talk show and print news around the world. For a while, during the tug-of-war fight, the puppet was held in a bank safe deposit box while the saga played out in the federal courts. During one day of deposition, puppetmaker Semok (who had performed various maintenance and re-painting of the original Howdy marionette beginning in 1989) was called upon to unseal a trap door on the back of the puppet's head; Velma Dawson, the puppet's original builder, who was 88 at the time of the deposition, was present and given the opportunity to examine the inside of the head in an effort to verify that the puppet in question was the original she created. Despite 50 years of numerous repairs, repaints, and replaced body parts, Dawson eventually declared the head of the puppet to be the one she originally made in 1948. The Detroit Institute of Arts ultimately prevailed and has custody of the original Howdy. It was announced in 2013 that, due to Detroit's budget deficit, the museum would be placing the puppet up for sale at auction. Originally an hour on Tuesdays, Thursdays and Saturdays (at 5 p.m. Eastern), the show moved to Monday through Friday, 5:30 to 6 p.m. EST in September 1948. During part of its run, it was preceded by the 15-minute program The Gabby Hayes Show, hosted by the veteran cowboy sidekick actor George "Gabby" Hayes. In June 1956, it began to be shown on Saturdays only, in a morning time slot (10-10:30 Eastern time), continuing until its final broadcast on September 24, 1960. The show continued as reruns until the early 1970's. The peanut gallery, circa 1949. Say "Howdy do" to you. It was, thus, one of the first television shows with audience participation as a major component. In many of the 1949–1954 episodes released on DVD by Mill Creek Entertainment in 2008, the children also can be heard singing jingles for commercial breaks, with Buffalo Bob or Howdy leading them and the lyrics appearing on screen. Colgate toothpaste, Halo Shampoo, 3 Musketeers candy bars and Poll Parrot Shoes are among the products advertised this way, as well as series-long sponsor Wonder Bread. The popularity of Howdy Doody and its Peanut Gallery led executives at United Features Syndicate to use the name Peanuts for syndication of Charles M. Schulz's Li'l Folks comic strip, reportedly to the lifelong chagrin of Schulz. Ted Brown fills in for Bob Smith as "Bison Bill". In September 1954, Bob Smith suffered a heart attack and was ordered to recuperate at home. NBC managed to keep the show going with guest hosts, including Gabby Hayes and New York disc jockey Ted Brown as Bison Bill, explaining to kids that Smith was vacationing at Pioneer Village. While kids generally were satisfied with the explanation, show sponsors insisted they wanted Smith himself to hawk their products. In response, NBC set up a special studio at Smith's home so he could appear live "from Pioneer Village" to do commercials. During Smith's absence from the show, Howdy was voiced by Allen Swift. Swift continued to voice the character for the remainder of the show's run, even after Smith's return in September 1955. Finally, in the closing moments, the surprise was disclosed through pantomime to Buffalo Bob and Howdy Doody; as it turned out, Clarabell the mute clown actually could talk. Amazed, Bob frantically told Clarabell to prove it, as this was his last chance. An ominous drum roll began as Clarabell faced the camera as it came in for an extreme closeup. His lips quivered as the drumroll continued. When it stopped, Clarabell simply said softly, "Goodbye, kids." A tear could be seen in his right eye as the picture faded to black. The show quietly ended with a roll of credits over an empty, darkened set as "Auld Lang Syne" was played on a celeste, followed by an announcement that The Shari Lewis Show would be seen in its place at that time next week, followed by a spot for the TV series National Velvet. The recently discovered and restored color videotape of the final broadcast is available commercially. A 1955 merchandise catalog had 24 pages showcasing the range of products licensed by the show. The extensive merchandising included the aforementioned puppet, toys and clothing, plus tie-ins with cereals and other food products. Dell published a comic book from 1950 to 1956 along with Little Golden Books and Tell-a-Tale books, many written by Doody head writer Edward Kean. In addition Dell scribe John Stanley contributed scripts for the comic book. Kean also did some scripting (along with Stan Lee) of a Sunday-only Doody comic strip through United Feature Syndicate which ran from October 15, 1950, to June 21, 1953. Milt Neil  and Chad Grothkopf  were the initial art team through December 3, 1950 after which Grothkopf handled the art solo. UPA was hired to do an animated cartoon (Howdy Doody and his Magic Hat) which was the first directorial effort of Gene Deitch and long thought lost until a print turned up at the Library of Congress in 2010. On April 15 of that year, the film was posted online. On February 20, 2001, NBC Home Video licensed Image Entertainment to release four individual discs, each containing four episodes. These shows came from the latter part of the series run, from 1957 to 1960. One show from April 1, 1953 was also included. Early episodes of Howdy Doody are available in the public domain and are online for audiences to view. In a 1975 episode of Happy Days, Richie Cunningham (Ron Howard) appears on The Howdy Doody Show after entering a Howdy Doody lookalike contest in Milwaukee. The 1970s brought a wave of nostalgia interest in an idealized representation of the 1950s, and with its films such as American Graffiti and the TV show Happy Days. An episode of Happy Days was entitled "The Howdy Doody Show" (number 33 of the series; original airdate February 18, 1975), during the series' second season, having a Howdy Doody storyline featuring Smith as Buffalo Bob with actor Bob Brunner as Clarabell. Shortly thereafter, Nicholson-Muir Productions (owned by Nick Nicholson and E. Roger Muir) acquired from NBC the rights to produce the New Howdy Doody Show, an attempt by Buffalo Bob and most of the old cast to recreate their past fame. 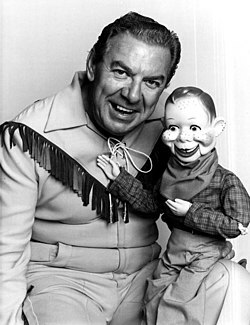 For this incarnation, which aired in first-run syndication, the Howdy Doody marionette had actual hair in a contemporary 1970s style and was operated by puppeteer Pady Blackwood. Nicholson Muir (portrayed by Bill LeCornec) - The flamboyant fictional producer of the show. He is named for the production company. Corny Cobb (portrayed by Nick Nicholson) - He is now working as a "prop man" rather than a shopkeeper. Jackie Davis (Himself) - The band leader. Happy Harmony (portrayed by Marilyn Patch, now Dr. Marilyn Plavocos Arnone) - A teacher in Doodyville who fills in the same role as the Princess SummerFallWinterSpring character. Lew Anderson returned as Clarabell. It was staged before a larger Peanut Gallery of children and their parents, originating from and taped in Florida. The revived series was not as successful as its predecessor, lasting only 130 episodes; the show debuted at the start of August 1976 and was canceled six months later at the end of January 1977. Reruns of the show later aired on Sundays on Cozi TV. Recently, Amazon Prime began offering 20 episodes online. A decade later, the show celebrated its 40th anniversary with a two-hour syndicated TV special, It's Howdy Doody Time: A 40-Year Celebration, featuring Smith, Anderson, Nicholson and LeCornec, who reprised his former role of Chief Thunderthud. Late in life, Bob Smith befriended New York-based fan Jack Roth, who already was quite familiar with Smith's gallery of puppet characters. Since Smith's death in 1998, Roth usually has provided the voice for Howdy in TV appearances and live venues. Actor-puppeteer Alan Semok, who was approached by Smith to re-create the Howdy marionette, also has voiced Howdy. Pee-wee's Playhouse drew from Howdy Doody during its successful run on CBS from 1986 to 1991. The film Back to the Future Part III features the Howdy Doody opening. On a 2012 episode of Mad Men, the character of Pete Campbell claims he is the "President of the Howdy Doody Circus Army" while verbally upbraiding a train conductor. The Dickies feature a song called "Howdy Doody in the Woodshed" on their 2001 CD All This and Puppet Stew. In the 2008 film Indiana Jones and the Kingdom of the Crystal Skull, Jones stumbles into a nuclear test facility where the show is playing in one of the houses. He takes cover in a refrigerator as the explosion slowly drowns out the sound of the Howdy Doody theme song. In the 1978 film Cheech and Chong's Up In Smoke, Anthony 'Man' Stoner (played by Tommy Chong) asks Pedro de Pacas (played by Cheech Marin) "Hey you wanna get high man?" to which Pedro replies "Does Howdy Doody got wooden balls, man?". In "Wally's Gang", a 1989 episode of Hard Time on Planet Earth, Control shows Jesse the Howdy Doody intro as an example of Earth's "most highly revered" electronic teachers. Like the later Sesame Street, Canadian, Cuban, and Mexican spin-off shows were licensed using local casts and duplicate puppets. In March 1953, the Kagran Corporation, the organization which produced the original Howdy Doody for NBC, started production on La Hora de Jaudi Dudi, a daily Spanish-language version of the programme filmed in Mexico City. The program aired over Canal de las Estrellas in Mexico and, beginning on April 27, CMQ-TV in Havana, Cuba. According to Billboard,, the series featured a freckle-less Howdy puppet and a new puppet named Don Burro. While the aim was to produce a series to distribute to the entirety of Latin America, the company halted production after six months due to unforeseen production difficulties (At the time, Mexican television programming was scarce and often improvised, unlike the American-influenced Cuban market, apart from the fact that Mexican broadcasters weren't interested in foreign production) and market considerations (Until 1960, most South American countries did not have television services or supermarkets—by 1953, the only ones in the region were located in Havana and Lima, Peru-). 96 half-hour episodes were filmed. Cuban television later launched its own local version, named Chiriltin, which lasted through 1959 or early 1960. The Canadian Howdy Doody Show made its debut on November 15, 1954, airing three times a week over CBC Television. Originating from the network's Toronto studios, the Canadian version of the show starred Peter Mews as forest ranger Timber Tom, who corresponded to Buffalo Bob in the U.S. version. CBC's Clarabell was played by Alfie Scopp. Robert Goulet is sometimes erroneously credited as Timber Tom (even by Goulet's official website and Buffalo Bob Smith), although he may have been an occasional fill-in host. William Shatner, the future Captain Kirk of Star Trek, also filled in for Timber Tom occasionally as "Ranger Bob". The Canadian show appeared more low-budget than its American counterpart and seemed watered-down, with less raucous plots and less villainous villains, as well as a more educational orientation. Much as the American version of the show was of the Western genre, the Canadian version was a Northern. Some of the stories were evocative nonetheless, almost stepping into high fantasy, and often featured Dilly Dally as an everyman hero who muddled through and did the right thing. Early in the run, there was a short-lived puppet character called Mr. X (no relation to a puppet of the same name who appeared on the American show) who traveled through time and space in his "Whatsis Box" teaching children about history. However, Mr. X was rather swiftly removed from the show due to some parental complaints that he was too scary. It has been suggested the Mr. X sequence may have inspired the creation of the long-running British science fiction series Doctor Who. In its earliest days, the series likewise was designed to teach children about history and, throughout the series it has featured an alien known only as the Doctor who travels through time and space in his TARDIS, which permanently is in the shape of a police box. The series' creator, Sydney Newman, oversaw the production of the Canadian version of Howdy Doody while working as head of programming for the CBC. The Canadian Howdy Doody Show ended on June 26, 1959. ^ Hevesi, Dennis. "E. Roger Muir, 89, Dies; Backed Howdy Doody", The New York Times, October 28, 2008. Retrieved October 28, 2008. ^ Tibbetts, John C. (2015). Those Who Made It: Speaking with the Legends of Hollywood. Springer. ISBN 1137541911. Retrieved January 21, 2018. ^ a b c Dicks, Phyllis T., ed. (2004). American puppetry: collections, history, and performance. McFarland. p. 326. ISBN 0-7864-1896-6. Retrieved March 30, 2012. ^ a b Rose, Billy (June 7, 1948). "Actor's Brain Sometimes Works Plenty Fast". The Evening Independent. Retrieved March 30, 2012. ^ a b c Letters to the Editors. Life. May 28, 1971. p. 19. Retrieved October 6, 2012. ^ "Howdy Doody". Wordpress. January 20, 2011. Retrieved March 31, 2012. ^ Rautiolla-Williams, Suzanne. "The Howdy Doody Show". Retrieved July 15, 2007. ^ "Howdy Doody puppet creator dies". The Desert Sun. September 26, 2007. Archived from the original on October 12, 2007. Retrieved October 2, 2007. ^ "Howdy Doody Puppet". National Museum of American History, Smithsonian Institution. Retrieved July 22, 2008. ^ "TJ Fisher". tjfisher.com. Retrieved April 14, 2015. ^ a b Davis, Stephen. Say Kids! What Time Is It?. Little, Brown and Company. ISBN 0316176621. ^ "Remembering Howdy Doody's Cast of Characters". Sitcomsonline.com. Retrieved July 14, 2010. ^ "David Copperfield Did WAY More Than a Cameo for 'The Incredible Burt Wonderstone'". yahoo.com. ^ Morris, Tim (January 5, 2008). "Schulz and Peanuts". Retrieved November 17, 2008. ^ The New York Times, Buffalo Bob Smith, a singing piano player and chatty radio disk jockey who created Howdy Doody and then teamed up with the puppet on one of early television's most enduring children's shows, died of cancer yesterday at a hospital near his home in Flat Rock, N.C. Mr. Smith was 80. ^ Frank M. Young. "STANLEY STORIES: Stanley Does "Doody"--Infuses Stale Puppet, Sidekicks With Energy (Selections from Howdy Doody 4 and 7, 1950/1)". stanleystories.blogspot.com. Retrieved April 14, 2015. ^ "Stripper's Guide". strippersguide.blogspot.com. Retrieved April 14, 2015. ^ "''Lost UPA Cartoon: Howdy Doody and his Magic Hat''". Cartoonbrew.com. Archived from the original on December 2, 2009. Retrieved July 14, 2010. ^ tavm (April 16, 2010). "Howdy Doody and His Magic Hat (1954)". IMDb. Retrieved April 14, 2015. ^ "TV #22: Howdy Doody and His Magic Hat (1953) | Cartoon Brew: Leading the Animation Conversation". Cartoon Brew. Retrieved April 21, 2016. ^ "Howdy Doody Show: 40 Episodes 1949-1954". DVDEmpire. Retrieved April 14, 2015. ^ a b Howdy Doody entry at allmovie.com; retrieved January 29, 2010. ^ "The Torontonian roots of Doctor Who — the Canadian behind the legendary TV show". Spacing Toronto. Retrieved April 14, 2015. Wikimedia Commons has media related to Howdy Doody. Davis, Stephen (1987). Say Kids! What Time is It? Notes From the Peanut Gallery. Boston: Little, Brown and Company. ISBN 0-316-17662-1. This page was last edited on 23 April 2019, at 19:04 (UTC).